This anti-Blackberry tirade was written late one night in May 2008 as I waited for a much-delayed flight back from Germany to the UK. Looking back at the piece now, all I can say is that I must have been in a really bad mood when I wrote it! It's late on Tuesday evening and I'm stuck in a German airport, awaiting my return flight to the UK. All around me are business types, all twiddling away intently on their Blackberry devices. While many have found the Blackberry to be a godsend, an efficient tool for staying connected to the office when out and about, my personal opinion is rather different. It's my firm belief that the devices developed by Canadian firm Research in Motion (RIM) have ruined email as an effective means of communication. Screen estate - The small screen of the Blackberry makes it difficult to read emails that are longer than a couple of paragraphs. Reading a lengthy email on one feels like trying to read a newspaper through a letter box, only able to see a couple of lines at a time. Whereas once you could send a lengthy email, confident that the recipient would be able to view it in full on their PC's monitor screen, the key points in emails of today must all fight for inclusion in the first paragraph, or risk being overlooked or ignored completely. It's even worse when it comes to attachments. There's virtually no point in emailing a Blackberry user supplementary material as chartware, spreadsheets or documents because Blackberry users are unlikely to take the time to download them via their limited wireless connection. And even if they do download them, they may struggle to open the document because of the limited compatibility with Microsoft Office formats. And even if they do manage to download them AND open them successfully, they'll struggle to comprehend the information because of the Blackberry's aforementioned postage-stamp-size screen. Micro-sized keyboard - The small keyboard on the Blackberry makes it difficult to send responses longer than a sentence or two. In the past, email responses could be lengthy and considered affairs. Now they are rushed out in a single sentence, without space or time for insertion of nuance, with barely any punctuation or appropriate capitalisation. Expectations of immediate response - Once upon a time, if you wanted something urgently from someone, you'd give them a call. If something wasn't so time critical, you'd send them an email, expecting the recipient to get back to you within a couple of days or so. The Blackberry changed all that. With the ability to receive emails on a portable device, many now send emails with the firm expectation that the recipient will immediately action the request. The seventy-two hour grace period that used to exist has been reduced to an hour, and sometimes less. Damage to work/life balance - The Blackberry has instilled expectations with many managers that their Blackberry-carrying employees are on-call 24/7. This was even proudly boasted about in a recent joint RIM/Orange advert that appeared in "The Economist" - various Blackberry devices were pictured under the tagline "It's officially the end of downtime". A Blackberry may be capable of operating 24/7 but no human can! They're addictive - Why do you think they're nicknamed "Crackberries"? Ever sat next to a Blackberry addict on a long trans-Atlantic flight and seen them grab their device on landing and log-in, clutching it as if their life depended on it? Another time I witnessed an addict nearly fall under an on-rushing London Underground train because they were too busy staring at their Blackberry screen to pay attention to where they were walking. These people need our pity, and our support. It's time to push back on the growing belief within business that the only way to advance your career is to sign up to carry one of these infernal devices. We need senior leadership to be making better decisions, not simply instant ones. The "Sent using Blackberry" signature tag shouldn't be regarded as a status symbol but instead as a cry for help, an indication that the individual in question needs help getting their life back in balance. 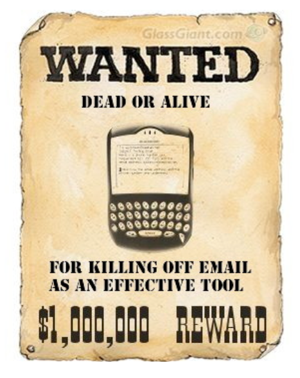 The Blackberry has reduced the value of email to little more than Instant Messaging. Email belongs on a full-size computer, not crammed on to a handheld device. Let's use Instant Messaging for small devices and reserve email for when we have access to proper computers.